As an undertaker, each family I serve has different ideas about what their service should be like, and I follow their wishes. Most often, people want something similar to what they've seen before. There is a comfort for grieving families, whose world has turned upside down, in following familiar rituals, and despite all the buzz about personalization, I cannot emphasize enough the importance of tradition and ritual. Another part of my job is to suggest new things to families that, in my experience, have helped others. I try to encourage participation in the service, and the consideration of rituals that may be new to them. As I have discussed in previous posts, traditions that are considered normal and appropriate in some places can seem disturbing in others. The traditions of closing a casket in front of family members and watching the casket as it is lowered into the grave, followed by sprinkling a handful or shovel of earth into the grave, are not as extreme to people where I work in rural Wisconsin as a sky burial or promession would be, but many here say they couldn't bear to do any of them. Where I used to work in Portland, Oregon, watching as the casket is closed and again, as it is lowered are regular parts of the service, and I think that they can be healthy and meaningful for grieving families. 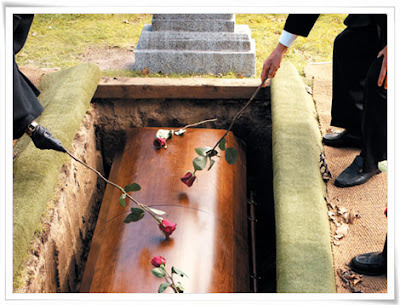 In the Jewish tradition, among others, family and friends sprinkle the casket and grave with earth. This is a wonderful symbolic act of participation in the burial and accepting the reality of death. At my father's burial, I shoveled some earth into his grave, and even at the age of 8, it was a moving and cathartic experience for me. One of the most important things a funeral does is to allow the grieving to accept the reality of death in a safe and comforting atmosphere. Participation in the rituals helps us to perform that last loving service for the deceased, and that in turn allows us to accept emotionally, the reality of the situation, so that we may in time move on back into life. In our minds, we know that the person is dead, but our hearts are reluctant to accept this unpleasant fact. Watching and helping with these tasks can be emotionally demanding, but I believe it makes the rest of the journey that much easier. We will certainly cry when we do it, but those emotions need to be expressed and worked through, and the funeral can be the best time to do it.